GOLD BULLION slid to 2-month lows near $1300 per ounce against a rising US Dollar in London trade Wednesday, on track for an August loss as US jobs data beat expectations. Commodities retreated but global stock markets ticked higher while US Treasury bonds slipped, nudging yields higher, after new data ahead of Friday’s official US jobs estimate said employers added 177,000 net jobs this month, just beating analysts’ average forecasts but down from July’s strong growth. Betting in the futures market continued to put the odds of a US Federal Reserve rate hike at the September meeting 3 weeks from today at 1-in-4. Heading for only its second monthly loss of 2016 to date, gold bullion on Wednesday morning recorded its lowest London benchmark since 28 June at $1314.45 per ounce, down some 2.1% from July’s 3-year monthly closing high, before sliding towards $1300 per ounce. That still put the metal some 23% above the end of 2015. “[The] neckline of the broad inverted head and shoulders at $1307/$1300 should be a key level,” says the latest technical analysis of gold prices from French investment and bullion market-maker Societe Generale, pointing to the bullish chart pattern it saw in the metal’s sharp recovery of early 2016. After accounting for inflation, real US interest rates have dropped sharply since the Fed’s first and so far only rate hike of the last decade, made in December last year, with real 10-year US Treasury bond yields falling from 1.57% to 0.62% net of the official CPI inflation rate. “Both the level of the US Dollar and US real rates reflect greater optimism about the US economy [than in 2011],” says a precious metals note from Australian financial services group Macquarie, meaning that gold’s previous record highs “seem out of reach…though concern over both [the currency and economy] will provide a firm underpinning. “Overall, we think the Chinese gold market will continue to grow,” says a new analysis of the No.1 mining and consuming nation from Canadian bank RBC’s commodity strategist Christopher Louney, “but lower net demand and continued supply growth means that the shortfall should narrow this year,” helping curb world prices until jewelry buying turns high next year. Lower Chinese supply, rather than growing demand, explains why Shanghai prices have risen above global quotes but delivery volumes have fallen, says a note from specialist analysts Thomson Reuters GFMS. 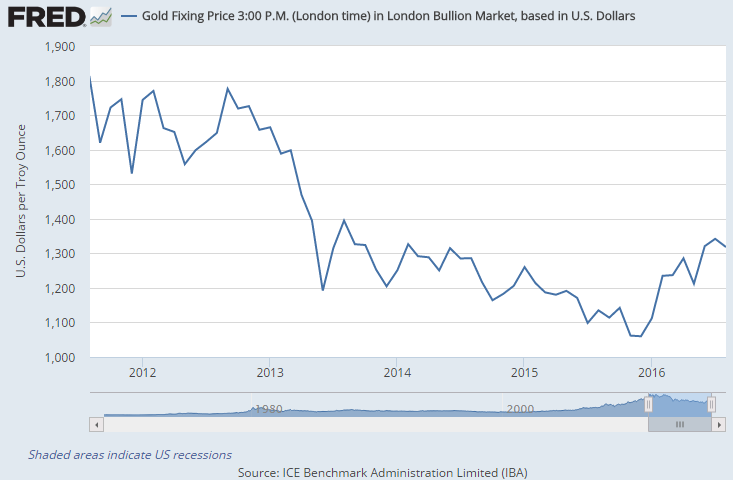 “Delivery volumes on the SGE were down to 118 tonnes in July, the seventh consecutive monthly decline on an annual basis [yet] the premia to the LBMA Gold Price edged higher, averaging $5.50 per ounce in July from $3.77 a month earlier” and then rising to $5.60 as delivery volumes hit new 2016 lows. Silver prices also retreated with gold bullion on Wednesday, but held just above Monday night’s new 2-month low of $18.62 per ounce in spot trading.